Get 17% off the MSRP on the Jensen Global (JGDFV25V) Foot Valve Syringe Dispenser w/Vacuum (Q Source SKU: J004-000293) when you use our FPF101014 Coupon Code. This Featured Product Friday (FPF) promo is valid from today, October 10, 2014 through Sunday, October 12, 2014. This economical industrial Syringe Dispenser features a built-in regulator and gauge for dispensing syringes of varying sizes. 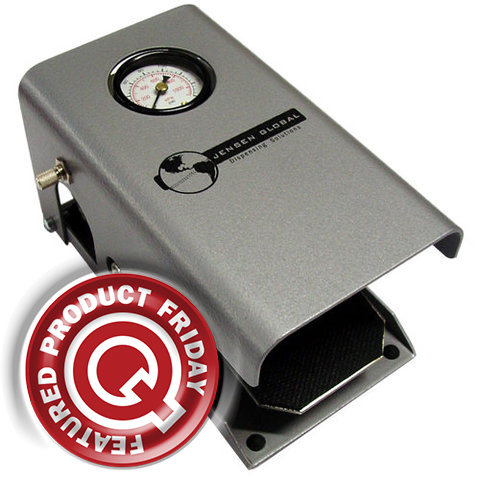 The integrated vacuum venture regulator allows pull back of material into the needle. Regularly listed at $325.00, but with our FPF code savings you’ll get it for just $270.00. While this is a 3-day limited-time price, the coupon is unlimited. Use the code as many times as you like while it is valid—and please feel free to share the code with your friends, colleagues, and via social media.